In the aftermath of what was a night of mayhem, the #parisattacks, for France, French President Hollande responded with a resolve to fight, “…we will lead the fight. It will be without mercy” in a broadcast to the whole nation. And it was not an empty threat, as french fighter jets dropped bombs on ISIS locations in Syria the next day, in what have been termed “symbolic” strikes. Among the ISIS sites bombed was its command center, its ammunition storage base, its recruitment center and its training camp. However, ISIS claims it moved from those locations before the bombs were dropped. France, has shown its readiness to go to war by these bombings. Before the attacks on Friday, the french had restricted their random air strikes to some parts of Iraq and had only bombed Syria sparingly. However, President Hollande who promises to be ‘unforgiving with the barbarians’ is no longer reluctant gone, and more air strikes should be expected in both Iraq and Syria, the New York Times reports. In a show of solidarity with France, President Obama called his french counterpart Francois Hollande to offer his condolences and support after the terror attacks. The United States shared some of its intelligence on ISIS with France, in which France acted upon in yesterday’s bombings. Since last year the United States has been bombing some ISIS locations with little to no results. It has also refused to send in a large number of foot soldiers, seemingly hesitating in meddling too much in the crises. However, with France deliberating on invoking article 5 of NATO’s mutual defense treaty, all member countries including the USA will be mandated to fight with France against ISIS. This could indicate the beginning of a World War 3. 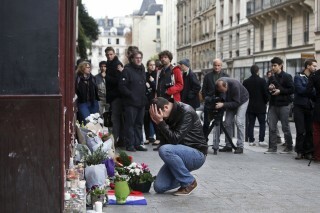 France declared a state of emergency after the attacks on Friday. Some French and International Security officials are currently occupied with the manhunt for one of the attackers, Abdeslam Salah. Another man, Omar Ismail Mostefai, believed to be one of the suicide bombers at the Bataclan music hall also escaped and is also been sought after by the police. Meanwhile, the french police has raided several cities in France, in a clamp down on terror suspects all over the Nation. Presently, 104 jihadists have been placed under house arrest while 23 have been arrested. France and Germany have the largest population of Muslims in Europe. France also has the highest population of ISIS supporters in Western Europe. France is in the “Grey zone”, a term coined by ISIS predecessors, Al-Qaeda. ISIS plans on inspiring fear by hitting countries with high populations of Muslims, or as aforementioned, “the grey zone”. ISIS believes that by using this strategy, the citizens of these countries would lash out and persecute non-extremist Muslims in retaliation, further polarizing these Muslims and forcing them to support ISIS. A statement made by ISIS after the attacks, “the first of the storm”, has been suggested to mean they plan to cause more turmoil in France. However, analysts have underscored that the French should not play into their hands, but rather show support to innocent Muslims who will encounter persecution and discrimination. Experts have emphasised that this is beginning of a new approach from ISIS. Unable to make the impact they desire in their own territory, it appears ISIS’s new battlefront is not just Iraq and Syria, but around the world. With two attacks in three weeks (the plane crash in Egypt and the attacks in Paris), ISIS seems to have total control and dominance over its affiliates and jihadist terror cells all over the world. There are indications that these attacks would be replicated in places where ISIS affiliates are e.g. Boko Haram in Nigeria, and in western countries.